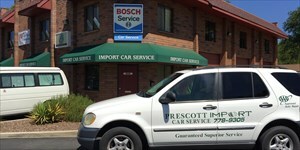 Prescott Import Car Service is an AAA Approved Auto Repair Top Shop for nine years running and a Member of the Better Business Bureau of Central/Northern Arizona since 2001. We are also a Bosch Car Service Center as well as a Volkswagen Authorized Service Center. We only employ ASE Certified technicians. Prescott Import Car Service is a business sponsor of iATN, which means they have access to over 2.0 million years of automotive experience through the iATN Knowledge Base and network of over 80,000 members. They have been a member of the International Automotive Technicians Network since 1997. We are a Bosch Authorized Service center providing proper repair and maintenance since 1981 for Mercedes Benz, BMW, Audi, Volvo, Honda/Acura, Toyota/Lexus, and Subaru automobiles. We are also a Volkswagen Authorized Service Center providing warranty repairs and service for all of Northern Arizona. We operate out of clean and modern six bay brick building conveniently located near downtown Prescott. 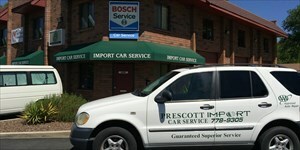 Email: You can contact Prescott Import Car Service through this form. Location: We are located on the Northwest corner of Hillside and Ruth streets two blocks south of the light at Whipple and Ruth.